With Father's Day just around the corner (it's on the 19th of June - next Sunday) why not treat your dad to a wonderful fragrance. Fragrances are associated with memories. They remind us of special occasions and people and rekindle beautiful memories. 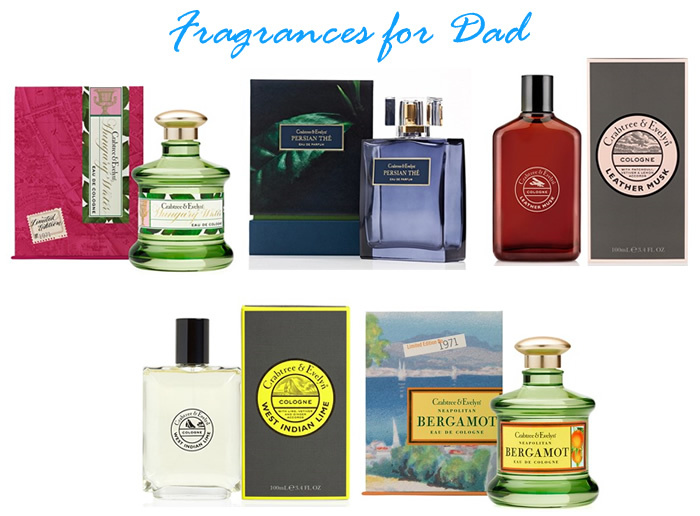 I have listed out 5 beautiful fragrances from Crabtree & Evelyn, that would make wonderful gifts for dad. There is something to suit every dad. Have a look at the list and you might find a fragrance that suits your father perfectly. With a touch of modern day alchemy, Hungary Water Eau de Cologne pays tribute to Rosemary, the ingredient at the heart of the original tonic ‘L’eau de la Reine d’Hungrie’. This restorative herbaceous scent is steeped with uplifting notes of Pink Pepper, Spearmint, Cypress and Geranium, blended with the aroma of Amber and Musk. The result is a citrus aromatic bursting with youthful beauty and elegance. A stylish and smoky blend of black Tea with a warm base of woods and Amber, Persian Thé’s smoky aroma is refreshed by the menthol tones of Cardamom and Cinnamon’s fruity-peppery nuance. A very tasteful and long-lasting scent, Persian Thé is sure to draw in the compliments. One of the most luxurious and powerful Musk fragrances I have come across in recent times. This is one of the new men’s cologne from Crabtree & Evelyn and comes in a beautiful auburn coloured bottle presented in a grey box. This fragrance blends the scent of rich leather with soft, musky tones. Indonesian Patchouli and Haitian Vetiver bring in a warm, woody appeal while Lemon adds an uplifting accent. A very sophisticated, masculine and luxurious fragrance. Mr.H loves this and so do I. Fresh Limes and Vetiver blended with Nutmeg, Ginger, Coriander, and Juniper make this a very invigorating and energising scent that is perfectly suited to the adventurous dad. Mr.H loves this one too - fresh, spicy and an uplifting fragrance. This one is a classic Bergamot scent. Italian Bergamot and Sicilian Lemon blended with notes of cool Black Pepper, heart accords of Ginger, Lavender and Thyme and base notes of Nutmeg, Amberwood, White Musk make this an enticing aroma. For lovers of citrus fragrances, this one would be a very good pick. All these fragrances are available to buy from Crabtree & Evelyn.